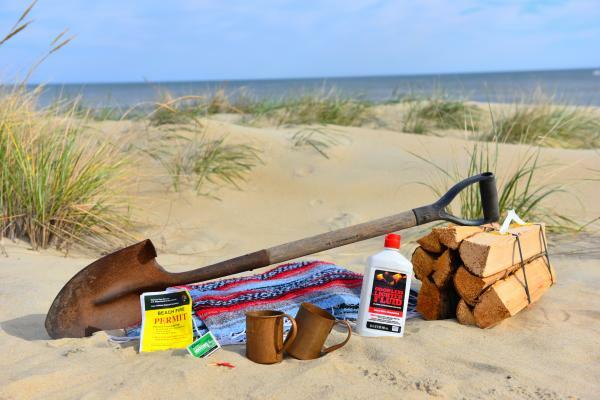 Learn how to build a beach fire along the shoreline of Cape Hatteras National Seashore or Nags Head beach. We’ve created a short guide to help ensure your experience is error-free and unforgettable. 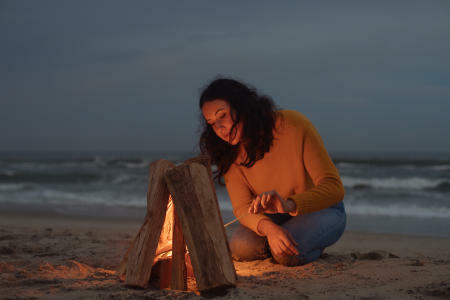 Let’s dig into the logistics…the when, where and how of executing the perfect Outer Banks beach fire. 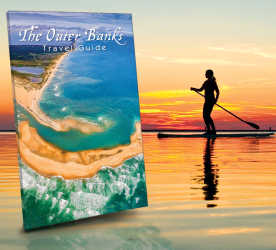 When describing the OBX, we jokingly quote Mark Twain, “If you don’t like the weather, just wait a few minutes.” In order to safely make a beach fire, winds must be below 11 MPH and no other special weather conditions, events, or fire conditions issued. It’s best to check with the National Park Service and local fire stations to ensure there are no temporary bans. 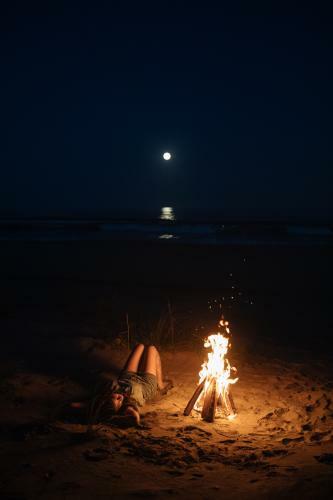 To make your fireside chat even more special, aim for nights where the sky is completely clear for stargazing. Keep tabs on the moon cycle to catch its fullest phase and you’ll enjoy “lit” water from the extra glow and reflection. 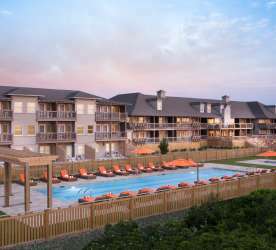 Choosing the right locale is not difficult. Fires are only permitted in Nags Head and Cape Hatteras National Seashore, with restrictions. Click to get your Nags Head permit here ($10) and Cape Hatteras Permit here (free), each includes additional instructions. Fires are not permitted in Duck, Southern Shores, Kitty Hawk, or Kill Devil Hills. 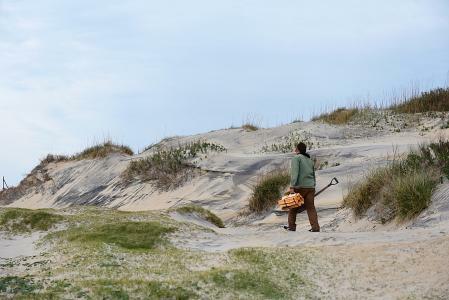 For an added bonus, look for locations close to Bodie Island Lighthouse or Cape Hatteras Lighthouse and catch glimpses of their beacons in the distance. Once you have decided on the perfect location and printed your permit, it’s time to gather supplies. Flashlights, kindling, matches, lighter fluid, a shovel, and bug spray are recommended. Our advice is to carry everything in a bucket, which you can later use to collect ocean water for pouring over the ashes. You can get most of these supplies at any local hardware store. The best wood is dry wood. Dense hardwoods like maple and oak have a higher energy content and will therefore release more heat and provide longer-lasting burns. Always bring ample kindling and other scraps to ensure an easy start. Fireside beverages and s’mores are a treat that never disappoint! Start building a 3&apos;x3&apos;x2&apos; hole in the sand and send the onlookers to scavenge for driftwood to feed the soon-to-be fire. Take loose sand from the hole and build a circular wall to block the wind. Stack your kindling and small sticks in a teepee structure and light your fire. Use lighter fluid if necessary and begin adding larger pieces of wood as they catch flame. Enjoy your warm fire with the sound of crashing waves as a backdrop. Keep an eye out for ghost crabs or unique shells along the shorebreak. As the night comes to a close, be sure to remove any large pieces of remaining wood or debris, extinguish completely with water, and cover the hole. Follow the Leave No Trace ethic and clean the area of all trash before leaving the beach. 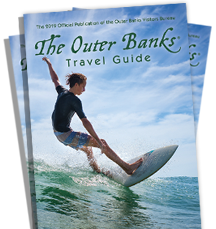 Be sure to document the event from start to finish and tag us on social (@theouterbanksnc)!